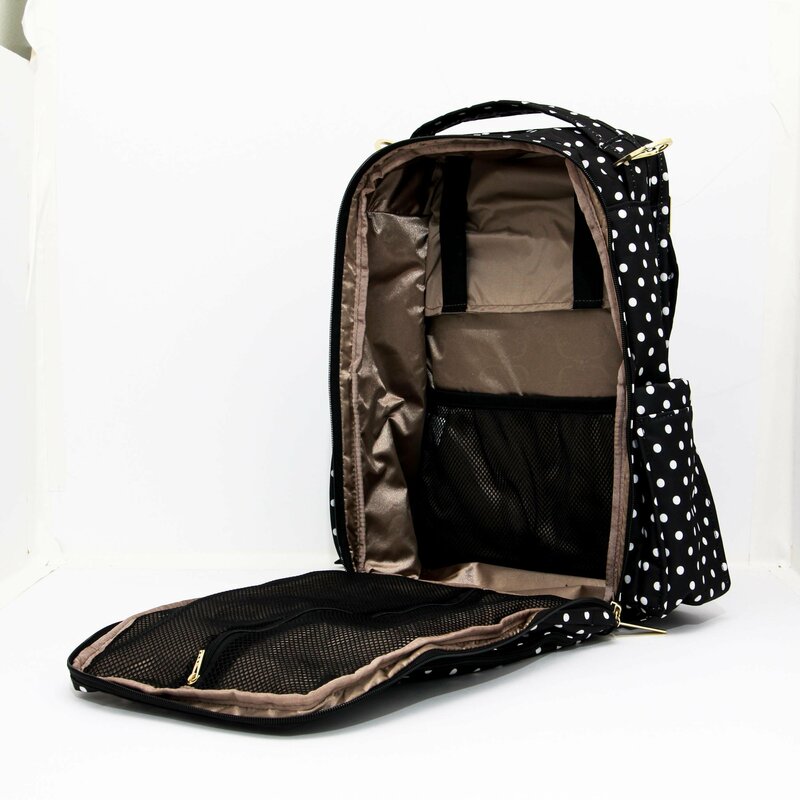 Jujube Be Right Back Legacy Diaper Bag - The Duchess is the premium version of Jujube Be Right Back Backpack Diaper Bag designed especially for professional women using timeless black and white tones. This bag is the ultimate hybrid between a traditional full-featured ergonomic backpack and the beautiful form and details of a fashionable bag! This backpack features ergonomically curved and padded shoulder straps for comfortable carrying, padded back panel with breathable mesh as well as durable, signature Ju-Ju-Be stitching! Parents will love the quick-grab handle, cell phone pocket as well as the Mommy Pocket with diapers and wipes pocket on the front while 2 exterior insulated bottle pockets with Thinsulate™ 3M™ technology are on hand to keep baby's drink bottles warm or cold! As with all Ju-Ju-Be diaper bags, this Be Right Back Diaper Bag has AgION® Antimicrobial Linings that kills germs, mold, mildew, fungus and bacteria. Your little one will also love the super cushy and comfy memory foam changing pad included! Does this bag come with the fuel cell and all the other smaller set pieces as featured in the video? Thanks! No, it does not come with anything except a travel changing pad. The video is someone doing a review of the bag using her own belongings. Click here for a link to see image of the interior of this bag. Hello! Does this bag comes with a diaper changing pad? Can this bag fits 14 inch laptop? This bag dimensions is W 30 x H 40 x D 12.7 cm. You may check if your laptop can fit. Can you hang it on your stroller? Yes, you can. It has D-ring loops at the top of the bag to hang on to stroller. Do all the Be Right Back series have the same dimension or does the dimension differ from one prints to the other? All Be Right Back have the same dimensions. Will the Sarah wells cooler bag fit into this bag? The dimensions for the 2 bags are as follows. You may check if the cooler bag can be fitted inside the backpack. Print is classic that both mummy and daddy will carry. Interior is spacious with many compartments to store baby stuff for easy reach. Well spent purchase! the print is so classy and gorgeous. compartments are practical! Love the deisgn on the bag . It is very classy and easy to carry . Sturdy bag . Really worth the buy. Get it during promo. This is my 1st purchase and wont be the last. Coz i love the quality of the bag & print. Love the classic polka dot design. The lining is a really stylish bronze colour and all the compartments are very well thought out. No regrets whatsoever,loving my purchase so much! Fell in love with the bag once i saw it and it went OOS once. Got it without thinking the moment it was replenished. Very spacious and stylish for a new mama. Even daddy can carry. Good deal & buy! Love my brb monarch so much and decided to get one for a friend. Bag is of good quality, very well constructed and sturdy. Has plenty of room to pack, lots of compartments for organizing and easy to reach for stuff thanks to the big opening. Best of all i know im getting a brand new piece for a reasonable price!